Black Metal has never been a genre to compromise. From its volatile beginnings, its unpredictable nature has led it to be one of the most infamous sub genres in the Metal world. Mayhem, Burzum and Darkthrone paved the way for numerous acts around today. Traditionally having Norway as its paternal birth right, neighbouring country Sweden has proven more than fertile ground creating what you could argue as being the second wave of Black Metal, Shining, Marduk and luminaries Watain. Combining the satanic atmosphere of Black Metal, the relentless aggression of Death Metal and the speed of Thrash Metal the band are an entity like no other. Now, returning from chrysalis after their 2013 release of The Wild Hunt, which many deem that the band’s claws had dulled, the band kicked off 2018 with the release of one of their most ferocious and back to basics, approach to date ,Trident Wolf Eclipse. With it being five years since me glimpsing the band become a real fire hazard outside a tent at Sonisphere, the live performance of Watain is an opportunity not to be passed up. Arriving at The Dome tonight, the atmosphere is thick with anticipation. After significantly drawing us in with aperitif Degial, it’s time for the hellish main course. 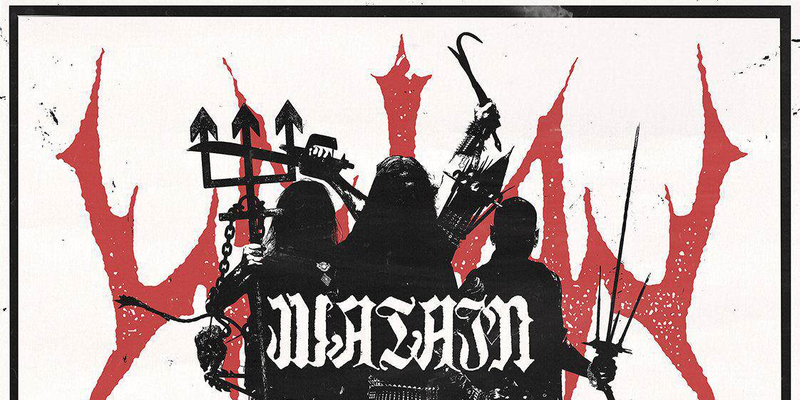 Adorned with tridents and enough firepower to make even Rammstein jealous, Watain are the masters of theatrics. Yet what lies in their charm live is the band’s ability to still be taken seriously despite what could be seen as an almost cheesy stage set up. Bursting into fan favourite “Legions of The Black Light” the band’s insidious riffs worm their way around our ears, taking no prisoners from the moment the enter the stage. With some of my personal favourites of the band’s catalogue being their more lengthy material, hoping for a “Waters of Ain” instead the band floored me with their unrelenting aggression Casus Luciferi numbers and Trident Wolf Eclipse. Bursting out of the gates with single “Nuclear Alchemy” sounding sharper than Frankie Boyle’s tongue followed later by “Furor Diabolicus” . Importantly the set came together cohesively to offer different elements from the band’s career. Of course the real cries of victory were reserved for the likes of “Satan’s Hunger”. Despite the slow dirge of instrumental “Lawless Darkness” conjuring more atmosphere for the legions tonight. Before being brought right back to earth with the arrival of “Malfeitor”. Despite their fierce musicianship however, there does seem to be something, just something ever so slightly amiss. Quickly rectified with the encore of “The Serpent’s Chalice”, a song that despite its just nigh of seven minute tagline keeps the ears pricked throughout. Though special mention should go to the unexpected reveal of Dissection’s “The Somberlain” cover, a real mic drop moment from the band. Proving that despite returning with their rough and ready, back to basics approach Watain still embody everything that Black Metal has stood for and are still the masters of live arena. Hail Watain! Watain’s excelled Trident Wolf Eclipse is out now, watch my review here!